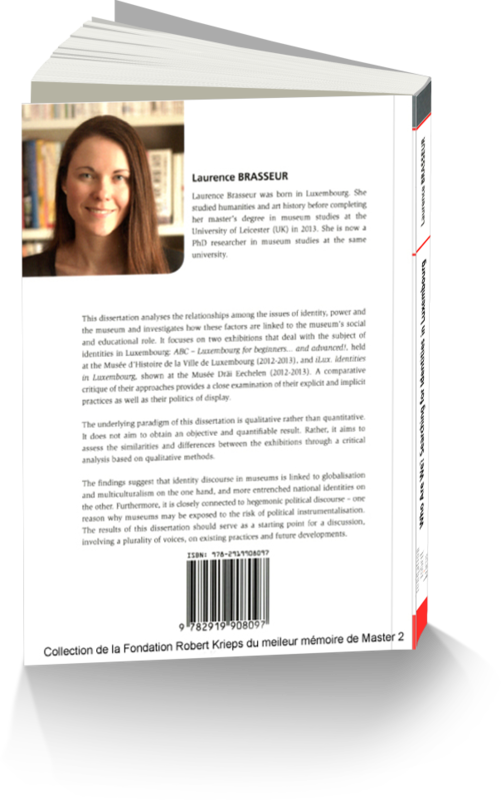 Le livre de Madame Laurence Brasseur vient de sortir aux éditions du Lëtzebuerger Land. Il est disponible dans les librairies au prix de 20 EUR. Laurence Brasseur was born in Luxembourg. She studied humanities and art history before completing her master’s degree in museum studies at the University of Leicester (UK) in 2013. She is now a PhD researcher in museum studies at the same university. This dissertation analyses the relationships among the issues of identity, power and the museum and investigates how these factors are linked to the museum’s social and educational role. It focuses on two exhibitions that deal with the subject of identities in Luxembourg: ABC – Luxembourg for beginners … and advanced!, held at the Musée d’Histoire de la Ville de Luxembourg (2012-2013), and iLux.Identities in Luxembourg, shown at the Musée Dräi Eechelen (2012-2013). A comparative critique of their approaches provides a close examination of their explicit and implicit practices as well as their politics of display.